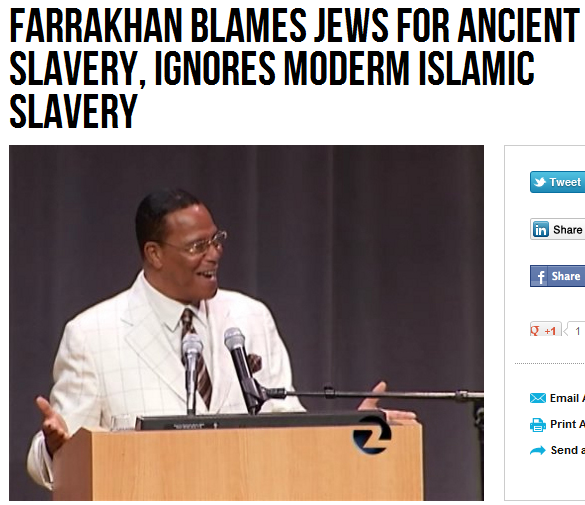 OBAMA SUPPORTER FARRAKHAN JEW-BAITING IN SLAVE TRAD RACIST RANT IN UNIVERSITY SPEECH………. – The Tundra Tabloids……. This race baiting anti-Semite is the foulest of the foul. He spreads his hatred and hopes the ignorant and feeble minded will bite. Islamic slavery was greatly curtailed due to the west’s revulsion of the trade, Islam, however, has institutionalized the slave trade and if not for Western involvement, the Muslim world would be openly buying and selling human flesh more than it is presently like in the Sudan and Mauritania. NOTE: It was Africans who not only captured their slaves for themselves, but also to sole them to to the foreigners. It was Africans who had the trade of slavery flourishing in their homeland well before the intrusion of the Muslims, and then the Westerners. Farrakhan will of course avoid these inconvenient truths because it undermines his bullsh*t.
This bigoted accusation is completely untrue and hypocritical. Charles Jacobs explains how there is still African slavery going on today, but the perpetrators are mostly other Africans and Muslims. Farrakhan claims that African-Americans should convert to Islam because it will set them free, yet he hides the fact that Islamic countries are enslaving Africans, even African Muslims. You can hear Charles’s interview with Frank, and all of our show, at Secure Freedom Radio. Previous Post Previous Post OBAMA’S MENTOR OF A PASTOR CALLS ON MUSLIMS TO RETAKE J’LEM……. In 1515 THE SPANISH CROWN Issued LICENSES to Spanish Noblemen to IMPORT African Slaves to the New World. In an area the size of NY, CT, and NJ combined, in Africa, in a single Year, Europeans PURVEYORS of the SLAVE TRADE. imported 394,000 GUNS, to be USED in the AFRICAN SLAVE TRADE.